Firstly, thank you for visiting our website. We’ve had a long time interest in vaping, and decided that writing about some of our favorite brands would be fun. And, we thought it might even help us earn a little extra cash! With that said, in the spirit of total transparency, how we decided to do that was that we reached out to some of the companies, and applied to become an “affiliate” – an individual who refers potential customers to a company, and promotes their products. The way it works is that if we are accepted as an affiliate by a company, we are given special links (called “affiliate links”) that – if a potential customer uses them – let the company know who referred the customer. If someone clicks our link, and then makes a purchase as a result, the company knows who sent the customer, and they in turn pay us a commission. 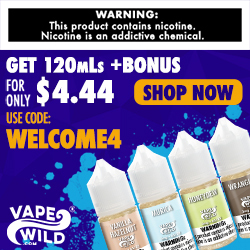 So, the links to the vape products you see on this website are affiliate links, which means that we may receive commissions through our recommendations or advertisements that are on our website. In other words, we may receive commissions for purchases made through links in our posts and articles. You should know that you will never have to pay more for purchasing through these links. The commissions that we may receive come from the merchant/vendor as our “payment” for referring sales. If you do purchase through our links, we are truly appreciative! This does not impact our reviews, as we feel it is important to deliver our honest opinion in our articles, through our experiences with the vape shops and products we have listed here. Please leave a comment to let us know you stopped by, or if you have experience with a business or product that we have a review of.